LE MOYNE DE CHÂTEAUGUAY, LOUIS, soldier and sailor; baptized 4 Jan. 1676 at Montreal, son of Charles Le Moyne and Catherine Thierry; d. 1694. 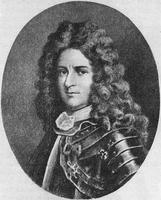 He was the tenth child of Charles Le Moyne de Longueuil. 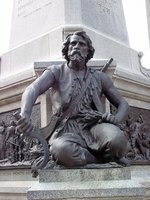 When still very young he took part in the expedition to Hudson Bay with his brother, Pierre Le Moyne* d’Iberville, who in 1693 requested a midshipman’s commission for him, alleging that Châteauguay was “able to manage a ship by himself as far as piloting and commanding are concerned.” During the siege of Port Nelson (York Fort), when he was responsible for preventing the besieged from breaking out, Châteauguay was killed by a musket shot on 4 Oct. 1694. He was serving as sub-lieutenant under his brother, Joseph Le Moyne* de Serigny. JR (Thwaites). Frégault, Iberville. A. Jodoin et J.-L. Vincent, Histoire de Longueuil et de la famille de Longueuil (Montréal, 1889), 155–56, 180, et passim. Charles de La Roncière, Une épopée canadienne (Paris, 1930), 79–81. Bibliothèque et Arch. Nationales du Québec, Centre d’arch. de Montréal, CE601-S51, 4 janv. 1676. Jean Blain, “LE MOYNE DE CHÂTEAUGUAY, LOUIS,” in Dictionary of Canadian Biography, vol. 1, University of Toronto/Université Laval, 2003–, accessed April 24, 2019, http://www.biographi.ca/en/bio/le_moyne_de_chateauguay_louis_1E.html.